Editor-in-Chief Professor Dr. Billy Long, Ferrum College, USA. Journal of Law and Criminal Justice is a refereed international journal that seeks to publish high quality research papers in the areas of socio-legal studies and the psychology of law, criminology and social justice studies. The Journal invites papers based on empirical research, theoretical analysis and debate, and policy analysis and critique. The journal is dedicated to presenting system-wide trends and problems on law, crime and justice throughout the world. It provides a forum for social scientists to report research findings for policy making with respect to crime and justice through innovative and advanced methodologies. 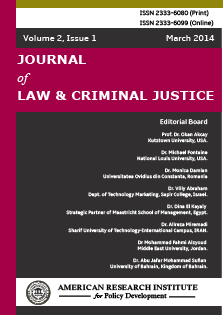 Journal of Law and Criminal Justice provides a comparative and international overview of law and crime and justice from a cross-cultural perspective. As a peer-reviewed journal, the journal encourages the submission of articles, research notes, and commentaries that focus on crime and broadly defined justice-related topics in an international and/or comparative context. Articles may focus on a single country or compare issues affecting two or more countries. Both qualitative and quantitative pieces are encouraged, providing they adhere to standards of quality scholarship. Manuscripts may emphasize either contemporary or historical topics. Each paper published in Journal of Law and Criminal Justice is assigned a DOI®number, which appears beneath the author's affiliation in the published paper. Click HERE to know what is DOI (Digital Object Identifier)? Click HERE to retrieve Digital Object Identifiers (DOIs) for journal articles, books, and chapters. Dr. Billy Long, Professor of Criminal Justice, Ferrum College, USA. Dr. Diana Bruns, Dept. of Criminal Justice, Southeast Missouri State University, USA. Prof. Mariusz Załucki, Andrzej Frycz Modrzewski KRAKOW UNIVERSITY, Poland. Prof. Dr. Gloria Esteban de la Rosa, University of Jaén, Spain. Dr. Ayşen Furtun, Dept. of Law, Kırıkkale University, Turkey. Dr. Ashgar Ali Mohamed, Civil Law Department, International Islamic University Malaysia. Dr. Jacob Gakeri, School of Law, University of Nairobi, Kenya. Prof. Khunou Freddie, Faculty of Law, North West University, South Africa. Dr. Mohammad Shakibi Nejad, Department of Law, Allameh Tabatabaii University, Iran.